Or view larger version. Pledge of Allegiance. April 20, 1942. Dorothea Lange, photographer. Gelatin silver print. Collection of Oakland Museum of California. Gift of Paul S. Taylor. Dorothea Lange took photographs at Raphael Weill School in San Francisco between April 16 and April 20, 1942 - nine days after the first wave of more than 600 Japanese Americans were evacuated from the city. 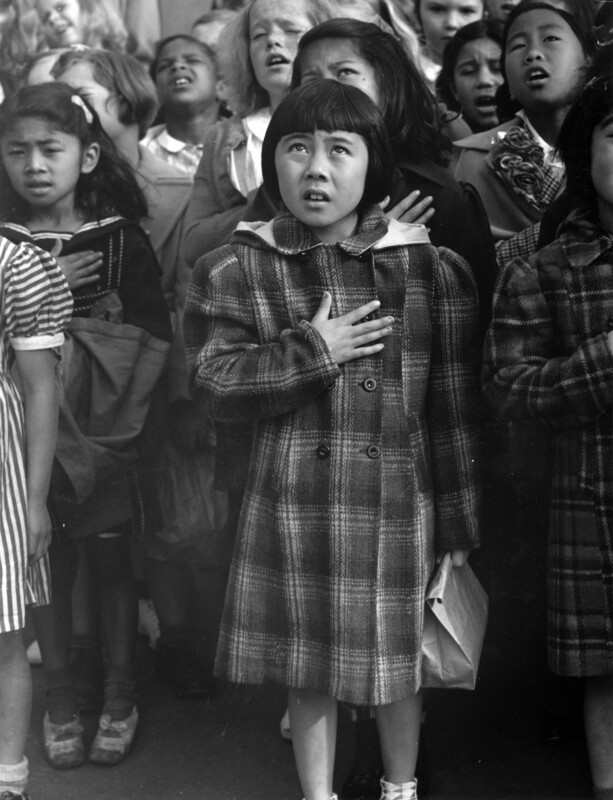 These photographs document patriotism expressed by children of Japanese ancestry in response to Japan's bombing of Pearl Harbor four and a half months earlier. By the end of May, all persons of Japanese ancestry living in San Francisco would be evacuated to various War Relocation Authority centers for the next three years, including all of the Japanese children in Lange's photographs.